Earlier this month, TAG released an new 2018 analysis by The 614 Group that found a dramatic 84 percent reduction in fraud when TAG Certified distribution channels were measured against the broader industry average. The analysis compared more than 75 billion ad impressions in 2018 from five of the largest ad agency holding companies, and it found that invalid traffic (IVT) rates were held to less than two percent in TAG Certified channels for the second year in a row. The 614 Group expanded its analysis from 2017 to include Sophisticated Invalid Traffic (SIVT) and a broader range of inventory types, including billions of video, mobile web, and in-app ads. Media coverage of the study included AdExchanger, MarTech Today, ExchangeWire, Business of Apps, SmartBrief, and WARC. The full 2018 TAG Fraud Benchmark Study can be found here. TAG’s Inventory Quality and Certified Against Fraud Working Groups have recently shared their proposed 2019 guidelines for review and comment. If you haven’t done so already, please take a look and let us know if you have any thoughts or feedback no later than December 18, 2018. Independent Validation will be required to certify European operations beginning July 2019. This will impact companies certifying their operations in one or more countries in Europe, the geographic region of Europe, or globally. Advertisers, agencies and adtech companies (i.e. Direct Buyers and Intermediaries) will be required to honor published ads.txt files, buying only from Authorized Sellers and Resellers identified within published ads.txt files. Provide accurate and consistent terminology to describe types of invalid traffic in order to foster transparency and collaboration in the fight against ad fraud. Provide sufficient granularity in terminology to help partners in the digital advertising supply chain resolve confusion and troubleshoot implementation issues for the purposes of reducing invalid traffic. Improve the process of resolving invalid traffic reporting discrepancies between different parties in the digital advertising supply chain, building trust throughout the digital advertising ecosystem. Requirements for advertisers and agencies (i.e. Direct Buyers) will be removed, refocusing the IQG Certified Program as a certification solely for publishers and adtech companies (i.e., Direct Sellers and Intermediaries). All participating companies will be required to classify content by brand safety ratings, aligned with the 4A’s Advertising Protection Bureau Brand (APB) Safety Floor and Framework. All participating companies will be required to refrain from sale of inventory that falls into an expanded and updated list of prohibited content categories. These categories align with the 4A’s APB Brand Safety Floor. The scope of the IQG Certified Program will be expanded to better address programmatic transactions. Any participating company passing bid requests will be required to ensure that programmatic buying disclosures fully comply with OpenRTB specifications v.2.2 or higher. All participating companies will now be required to implement and/or honor ads.txt files as described in the Certified Against Fraud guidelines above. After feedback from the TAG community has been incorporated, final documents will be released in early January 2019, and TAG will begin enforcing compliance with this new standard in July 2019. For any questions on the revised guidelines or information on the upcoming schedule of trainings, please contact Dominique at dominique@tagtoday.net. TAG 2019 Recertifications! Ready… Set…. Ready to get rolling on 2019 Recertifications? Starting on January 1st, companies will be able to submit 2019 Recertification Applications online using the new TAG Membership Portal. This will enable TAG Compliance Officers to submit applications, receive communications back from TAG, and make edits to your documents seamlessly. TAG will provide your log-in to the TAG Member Portal in early January 2019, when the submission period begins. A lot of progress has been made over recent years, which can be attributed to both emerging standards from trade groups like the IAB or Trustworthy Accountability Group (TAG), as well as the companies that have made significant investments in quality-focused technology and strict enforcement policies for these new standards. To quantify what companies committed to quality are doing, we have invested over $100 million in quality measures over the last few years, including $25M in 2018. There are a few clear things that all marketers can do: The first is to take more control over their advertising supply chain. Brand marketers should know every single party that touches a piece of their campaign. The second is to align around standards. Initiatives like the IAB’s ads.txt program have almost single handedly eliminated one kind of threat known as domain spoofing. 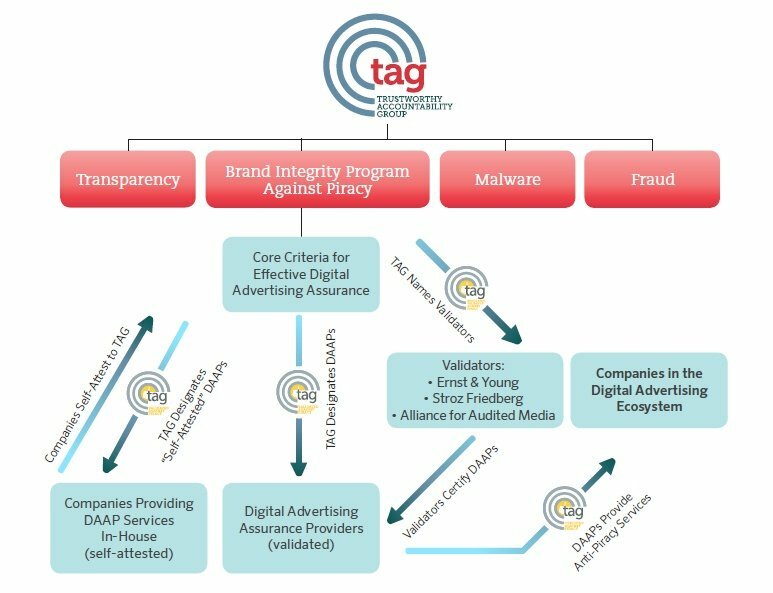 Other programs, like certification from TAG, have been shown to cut ad fraud by more than 80%. In the past few weeks alone, a new set of standards, the programmatic principles, came out in an open letter signed by the CEOs of a group of leading exchanges. Ad quality’s momentum is building as the major players continue to raise the bar.